Getnamo – Devblog – Page 2 – Its all about context. 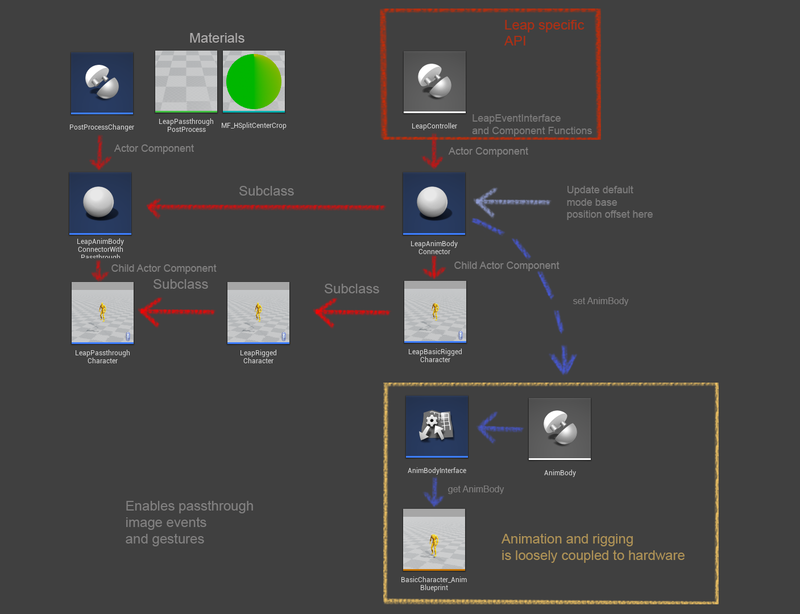 I’ve recently implemented a fully rigged collision blueprint in my unofficial leap plugin. The way it is constructed allows for you to change both the collision asset and mesh to suit your needs, while retaining the Leap Motion based input. I’ve also added easy IR passthrough support in the Leap Motion plugin, allowing you to transition from Virtual Reality to Augmented Reality with a simple gesture. Now you can reach for that beer without removing your headset! The architecture is finally starting to separate the input from the actual output and it should be relatively easy to have other input drive the rigged mesh. I may need some practice, but it is great to see that finger collision is accurate enough to do delicate separation. Leap motion tracking has come a long way! The Myo plugin has also been featured on Thalmic Labs’ Myo Unleashed series. Its a very concise entry on how to add Myo support to your game in UE4 in under a minute. Let me know if it helps! How would you like to climb in VR with kinetic energy from your swinging added to your jump? Welcome to the Developer blog! This demo is meant to allow you to explore bird flight with the closest possible experience. To gain altitude you will have to flap, once you gain enough speed you will glide and steer with tilt and yaw like you used to as a kid imagining you were a bird/airplane. All the instructions on flight are included in the Documentation, check out the flapping video below for an example of controlled flight. Can you find all the eggs? How good of a bird are you really? These very important questions in life need answers!